Gamlebyen (The Old Town) in Fredrikstad was founded 340 years ago. In 1567 the Swedish army burned down the medieval city of Borg, situated further up the Glomma river. King Fredrik II was determined to build up the city closer to the sea, and September 12th 1567 he signed the documents founding a new city where Glomma met the Oslofjord and he named it after himself - Fredrikstad, King Fredriks City. The first years the defences were constructed in wood, and the large walls you can see today was built from 1660 and onwards. 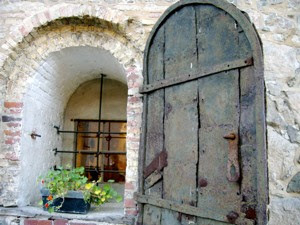 Today you can enjoy the most complete walled city in Northern Europe. I attended an international Conference in Fredrikstad from August 27th to August 29th. The hosts had arranged a guided tour around Gamlebyen in Fredrikstad. I have visited this beautiful city before, but that was more than 25 years ago. I remember I was very impressed at that time, but I recalled very little of my visit. Revisiting Gamlebyen, I found it to be even more impressive than I had expected. Tourist to Norway are recommended to stop and explore the historic and architectural pearl, located just 1 1/2 hour south of Oslo. Gamlebyen has burned several times and there was a great fire in 1764. Thus the buildings today mostly date back to the end of the 18th century. Some buildings made from stone are however much older and one dates back to when Gamlebyen was founded in the mid 17th century. 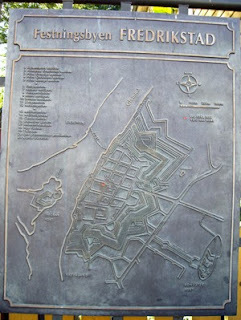 On the left you see a bronze sign with a plan over the city. It is completely surrounded by Glomma. Until early in the 19th century the bridges were lifted during night time, isolating the citizens from the rest of the area around. After the union with Sweden was dissolved in 1905 the military importance of Fredrikstad diminished. Around the walled city a larger city centre had grown up. From this time the old bridges were not longer in use and a permanent road crossed the waters, connecting Gamlebyen with the new city of Fredrikstad. Today Fredrikstad old city is a popular place to live. Here you find many quaint restaurants and shops. And the walled city used to be a free city, meaning that there were different laws within the walls than outside. Even today there are exception to the public laws in Gamlebyen. You may, e.g. enjoy your wine and beer in public areas, whereas you risk being imprisoned or heavily fined elsewhere. 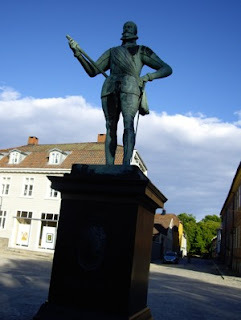 The coming days I will tell you more the history of Old Fredrikstad, so stay tuned! !